Recently I converted my P4 desktop into a home-theatre PC. Using a soft paint brush I dusted down the old innards till they looked like new, and mounted them into a new case. After powering it up, I was upset to hear a screaming sound coming from my otherwise quiet PC. This would not do for a home-theatre PC! Listening carefully to the motherboard I noticed two things. Firstly, the pitch corresponded with the workload of the CPU. And secondly, the sound appeared to be coming from the CPU itself! Doubting my ability to actually hear resonating electrons within the processor, I searched the web for an answer. I found a post that suggested the chokes were responsible, but how? 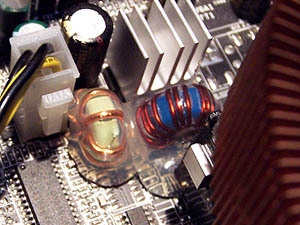 Alongside the CPU are a couple of inductance coils. These little toroidal coils "smooth out" the power going to the CPU. My guess is that the varnish that is used to coat the copper degrades over time, allowing the wire a tiny bit of "wriggle room". I further guess that the frequency of the AC power to the CPU must be within the range of human hearing. This movement then translates into sound, as each section of the wire succumbs to the changing magnetic field of the section before it. By blowing out the dust I had inadvertently removed the varnish allowing the coils to vibrate. Now I'm not sure if my next course of action was the best thing to do, after all it's based on my earlier guesswork, but the PC has been running for nearly two weeks now and all is fine. I coated the chokes in heap of hot glue, doing my best to contact as much of the surface of the wire as possible. I was pleasantly surprised when it worked! If you know what actually happens to create the screaming sound and the subsequent course of action to take, then please contact me—I'm curious to know the truth of the matter.